10 Years Ago Rory McIlroy's Dad Placed A $200 Bet That His Son Would Win The British Open Before He Turned 26… Awesome Story. Earlier today, Irish golfer Rory McIlroy won the British Open. He is now the third youngest person to ever win the British Open, behind Jack Nicklaus and Tiger Woods who won the tournament at 24 and 24, respectively. With the win, Rory walks away with a $1.66 million dollar purse. 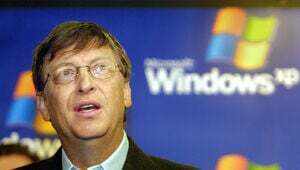 That brings his total career earnings so far to a tad under $33 million dollars. And it turns out that Rory isn't the only McIlroy who is smiling and making bank today. 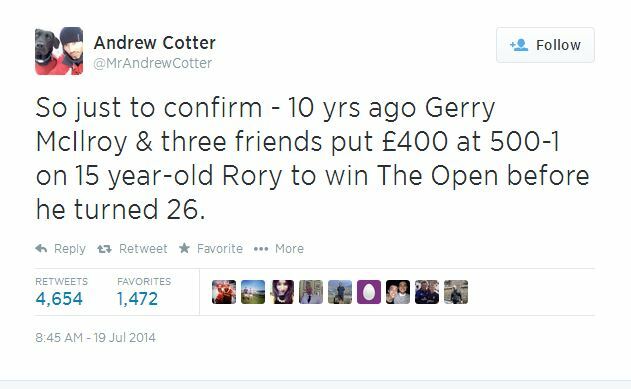 10 years ago, when Rory was just 15, his father Gerry McIlroy placed a £200 pound wager that his son would win the British Open before his 26th birthday. At the time, Rory was a teenage golf prodigy who was still three years away from turning professional. Three of Gerry's friends went in on the wager, bringing the total bet up £400 pounds (roughly $683 USD). The bet was so far fetched that the bookie who took the other side gave it the biggest odds allowable at the establishment. As we mentioned in the first paragraph, Rory just won the British Open. He is 25 years old. "From 12pm to 6pm I was a bartender at Holywood Golf Club, then, after going home for tea, I'd return to the sports club from 7pm-midnight to work behind the bar. I am a working-class man and that's all I knew – to get the money we needed for Rory to be able to learn and compete at golf." "I'll never be able to repay Mum and Dad for what they did, but at least they know they'll never have to work another day. I'll do whatever it takes to look after them." Oh, and in case you were wondering, Tiger Woods finished in 69th place (he he he). Not kidding.